This is the most common basic form of DTL shooting. A squad of 5 shooters stand 15 metres behind the trap house with unloaded guns. The referee will announce the event is ready to start. No. 1 shooter will load two cartridges into his gun, place his gun to his shoulder and call "Pull". The referee will release a target from the trap, the competitor will fire at the target. If he breaks it with his first shot, the referee will call "one", if he misses with the first shot he may fire a second shot at the target. If he breaks it with his second shot the referee will call "one". Regardless of which shot breaks the target, the score is the same, if the target is missed the referee will call "lost" and a score of zero is recorded. Immediately after the competitor has shot, he unloads his gun then No. 2 shooter will repeat the procedure and so on. After No. 2 shooter has shot, No. 1 shooter moves across to No. 2 position i.e. each competitor moves one position right after each shot. The club nominates the number of targets to be shot for each event. The procedure is the same as above except that if the target is broken with the first shot, the shooter scores 3 points, with the second, 2 points, a miss is zero. Is similar to double barrel except only one cartridge is loaded into the gun and one shot only fired at the target, the score is one or zero. Is similar to double Barrel Shooting except the shooter is placed further or closer than 15 metres from the trap according to ability. Handicaps are determined by rules laid out by the governing body. 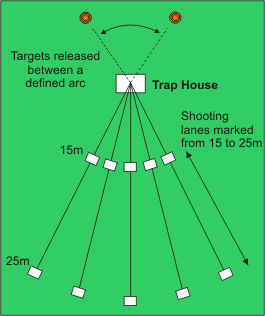 In this event the 15 metre mark and the squad are the same as Double Barrel but two targets are released simultaneously from the trap when the competitor calls pull, and the shooter attempts to break one target with each shot. The shooter can only fire one shot at each target. The score is one point for each target actually broken. In this event two shooters team up to shoot 2 targets released from the Trap simultaneously, the competitor shoots at "his" target first, if he breaks it with his first shot and his partner missed with both of his shots, the partner may use his second shot to attempt to break his partner's target, if both targets are broken by either shooter, a score is recorded. If neither or one is broken - no score is recorded. The event is shot with four competitors on the tracks at one time, the first pair using lanes 1 and 5 and the second pair using lanes 2 and 4. After shooting the first round of 5 pairs, competitors then change lanes, first pair taking lanes 2 and 4 and second pair taking lanes 1 and 5. Are a light hearted diversion from formal events. Their form can vary from event to event. They have no effect on the grade or handicaps of shooters. Is the trap discipline shot at the Olympic Games and World Championships. 15 traps are installed in a trench and are electronically released by acoustic microphones in random sequence controlled electronically.